Pretty notes, reminders to drink water and motivational quotes are all part of the Studyblr community of Tumblr. With their dedication to studying, they inspire people all over the world to be productive. What is the story of these "perfect" students? Pastel markers, ten different pens from Japan, and fifteen Moleskine notebooks. That’s what a regular blogger in the Studyblr community keeps on their desk. ‘Studyblr’ stands for ‘study’ and ‘Tumblr’, and it’s the name given to the community that shares their prettiest study notes together with all kinds of studying tips and tricks. Instead of sharing hateful and negative comments, the Studyblr community is a positive and radiant community that focuses on helping others with their homework and making it more bearable. The Studyblr community went viral in 2014 when students started sharing motivational texts and tips, and it became even bigger in 2015 with the addition of pictures of desks and “messy” beds. But how did this phenomenon grow to eventually be an entire online community? And how does this community fit in our mainstream society? Can we consider these students, who spend most of their time focused on their studies, as outsiders? These are all questions that arise when thinking about a community full of dedicated students. In my article, I want to research the Studyblr community and how they behave within our society. The whole Studyblr community communicates via digital infrastructures, and in order to understand how this group functions, I have used digital ethnographic research. Digital ethnography can be described as an approach to research “on online practices and communications, and on offline practices shaped by digitalization” (Varis, 2016). What is the Studyblr community? The Studyblr community is one of many interesting Tumblr communities. 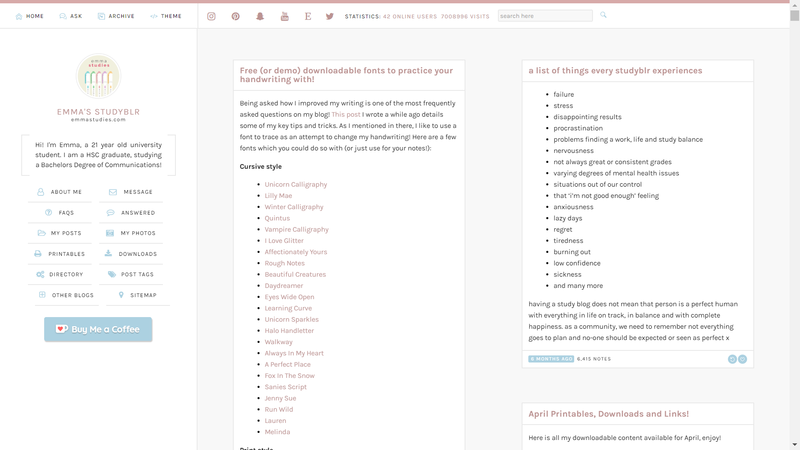 People from all over the world share their notetaking, organizing and study tips and tricks with the rest of Tumblr, striving for the highest grades possible. People who participate in the Studyblr community often post pictures of their own notes, their desk, or their stationery. Most Studyblrs follow a pastel color palette combined with white tones, but everyone in the community has their own unique way of taking notes and studying. The Studyblr community is not only for sharing your own pictures and notes. Students also help each other, they create different online challenges for studying, and they share templates for organizing and planning. Emma, also known as Emmastudies through her Tumblr blog, runs one of the biggest Studyblr blogs out there. Her templates, (free) monthly printables, and wallpapers are immensely popular in the Studyblr community, and now she even sells printables on her own Etsy shop. 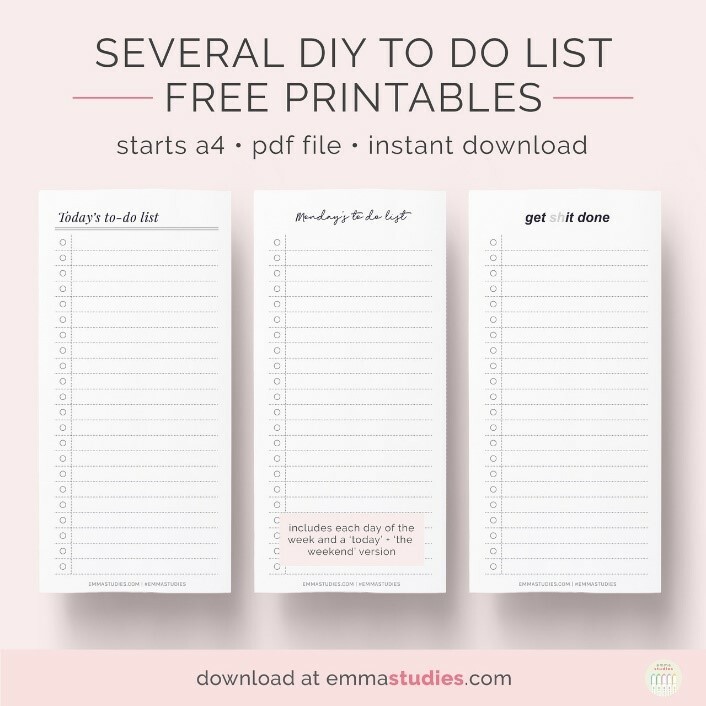 These printables are mostly helpful for time management and productivity or tools for studying. The Studyblr community went viral in 2014 when students started sharing motivational texts and tips, and it became even bigger in 2015 with the addition of pictures of desks and “messy” beds. The hashtag #studyblr was born, and it’s now a global community with students who all have the same goal. The community mostly consists of young women that vary in age from 16-year-old high school students to women in their 20’s in university. There are many toxic fandoms and communities on Tumblr, like #proana, that focuses on eating disorders, but the Studyblr community is mostly without any harsh comments or abusive inspiration. Mental health and self-care are an important part of studying according to the community, so taking breaks and doing something nice for yourself is necessary to maintain a healthy and productive lifestyle. Here are three examples of the positive and supportive community that is Studyblr. These examples show how you need to make yourself a priority, like the reminder that “you are lovely on your own”. There is a lot of awareness of mental health in the Studyblr community. People are constantly reminded to stay hydrated, get enough sleep and take care of themselves. Even though the Studyblr community is filled with positive thoughts and motivation, you could also look at it from a negative point of view. Of course, studying seems to be the main topic in the community. But there’s just as much focus on aesthetics and the presentation of your blog, as on studying and taking notes. Yes, organized desks and expensive stationery may improve the quality of your studying, but when you spend more time trying to take an aesthetically pleasing picture of your biology notes than actually reviewing them, there seems to be a shift in the main point of the Studyblr community. This shift might also contribute to a feeling of competition and envy. People look up to their favorite study blogs, so they might feel the need to buy the same expensive pens from Japan or use the same bullet journaling techniques to make it look as pretty as all the other Studyblr’s. 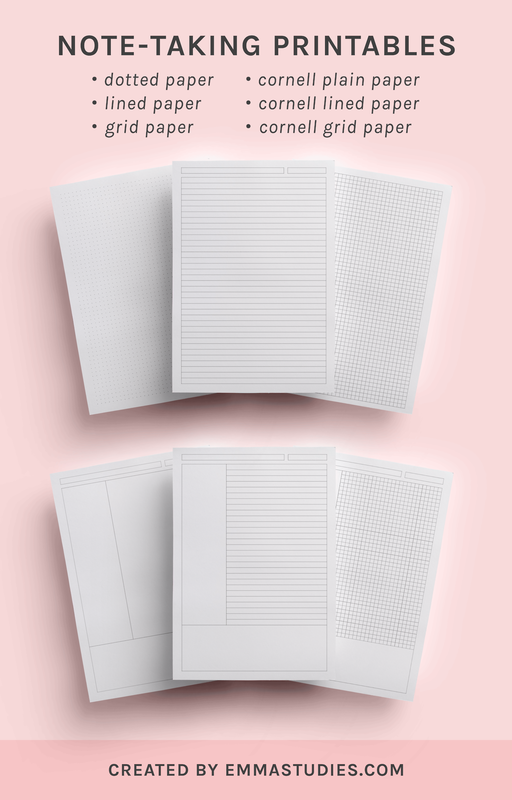 In both these images, we see the same Mildliners from the brand Zebra. These markers are extremely popular in the Studyblr community, as they are good quality products, but also because they add to the aesthetics of the picture. Because they are so big in the Studyblr community, it might feel like a requirement to have these markers if you want to become part of the community. The brand Zebra is originally from Japan, so it can be hard to acquire these pens if you live in a different part of the world. Shipping costs can quickly add up, but still, most people in the Studyblr community go through all this trouble to get the stationery they want, because the feeling of competition might be too strong or because they feel like the way their stationery looks is more important than its use. This creates frustration and discouragement within a community that was originally supposed to motivate you in positive ways. The focus on aesthetics is also misleading. When notes look more like artwork than study notes, it gives the impression that being a student is a stress-free experience with almost no negative aspects. And even though pretty notetaking might make studying more bearable, you still have to review your notes and work hard to achieve good grades. And even then you will not always get the grades you want. Studying comes with failure, but the Studyblr community radiates so much positivity that it seems like it’s always a fun experience to be a student. People in the Studyblr community, as noted above, all share the same goal when it comes to studying: making it as bearable and enjoyable as possible while maintaining their grades. They motivate each other and support each other in their studies, and it’s always in a positive way. The Internet has given these people with a unique passion for studying a platform and infrastructure to share their content with the rest of the world. With the growth that the Studyblr community has been through, we can say that the community is a global micro-population. A micro-population is a concept introduced by Ico Maly and Piia Varis (2015). In their article on the 21st-century hipster, they explain that “the world has become more complex due to new kinds of migration patterns and mobilities, the influence of new communication technologies such as the Internet, as well as the neoliberal logic of consumption and commodification.” Therefore culture and social groups, as a result, are a complex translocal and polycentric affair. Even though the Studyblr community is most definitely shaped only through an online infrastructure, we could consider it as a micro-population. The interesting thing about the Studyblr community as a micro-population is that their “culture” is not defined by their style in the sense of their own appearance, but it is defined by the style of their notes. The identity of someone who’s part of the Studyblr community is mostly shaped through their handwriting, the stationery they use and how their desk looks, instead of through the way they dress for instance. "Enoughness" is an important aspect of the Studyblr community. Even though the connection between members of this community can be found in their studies, being a good student does not make you a part of the Studyblr community. There are certain skills that you may need to maintain your place in the community. Think about handwriting as an example. Cursive, pretty handwriting is crucial if you want to make pretty notes. These notes also need to be structured and neat, and they are even better when combined with color coding. Because we are discussing an online community, it is also of importance to know how to maintain your blog, make aesthetically pleasing pictures, and connect with other Studyblrs to help your own blog grow. The identity people who run a Studyblr show online can be called a "scripted identity". "The notion of the script implies that, within computational ecologies, users may register or subscribe to certain identity templates, formats, or ideal types – and conversely, to cast off their alternatives " (Van Nuenen, 2016). On an online platform like Tumblr, the identity that is represented is scripted: they perform an identity in relation to the interface of Tumblr. This identity is about the characteristics that determine the demarcation between regular students and Studyblr students. This is a produced script, and this organizes the behavior of someone in the Studyblr community. Making notes and studying is not enough, for example. They make pictures of it, share it, and talk about it online. Striving for good grades and being an organized student, is the kind of behavior that mainstream society would look up to. The idea that a subculture would necessarily be a counter-culture or outsiders (Becker, 1966) does not apply here. The interesting thing about the Studyblr community is that their behavior is more proper than deviant. A student who runs a Studyblr is still a student. And the tips and tricks shared by the Studyblr community are often general tips that can be used by everyone. But even though they might not be seen as deviant, could you still consider the Studyblr community as an outsider community? You could say that their behavior as a student is different than the behavior of “regular” students. People who run a Studyblr put more effort in the way they present their notes and studying than other students would. An interesting thing is how the Studyblr community has a vintage feel to it. The material that is being communicated about consists mainly of notebooks, pens, and books, but the way they share it is through digital and network devices. Nowadays, most students bring their laptop to lectures and type their notes, but in the Studyblr community students write their notes down and use proper stationery. At the same time, pictures are made of Apple products, barista coffee and other modern trends that would be associated with hipsters. The Studyblr community is unique because of their combination of "old" and modern modes of study. The Studyblr community is thus best understood as an example of polycentric digital culture. It is not only about studying, it is about reproducing nostalgia for a time before they were born. It clearly aligns with hipster-semiotics and is driven by very specific ways of commodification. You do not just use a text marker, you also need to display the correct brand, together with the well-made barista coffee. In the pictures we see norms reappearing from different centres: hipster-culture, barista life and general digital culture all produce norms that are blended within the interface of Tumblr. All in all, the Studyblr community can be seen as an interesting and unique Tumblr community. After they went viral in 2014, the Studyblr tag helped create a whole new social community. This community is full of positivity, but it also creates competition and envy when it comes to grades or even expensive stationery. Even though there might be a shift in what the community focuses on, Studyblr will always be about studying and notetaking. People of the Studyblr community are not deviant, as they are not breaking any conventional rules or norms. On the contrary, they can even be seen as an inspiration for mainstream society. Their performance of themselves as excellent students is a good example of how every student would like to be, or how their elders want them to be. The way they present their notes as art is not a regular way of studying, so their behavior differs from “normal” students. The analog way of studying could also be seen as a unique thing, especially nowadays, when electronics rule the world. Studyblr culture is thus as much about presenting oneself as a hip student as it is about presenting oneself as an excellent student. In the Studyblr community, it’s all about handwriting, the color of your pen and the structure of your notes. If you ever need a bit of motivation for your studies, or just need some positive energy, the Studyblr community will be there for you. Just remember that the actual studying happens offline. Becker, H. (1963). Outsiders. New York: The Free Press. Tiffany, K. (2017). Welcome to Studyblr: A beautiful, stressful wonderland. ﻿The Verge.